Growing lettuce is the best way to have really crunchy greens daily. Growing lettuce is the best way to have really fresh greens daily. It's as easy as pudding 'n pie. Prepare just one yard of garden thoroughly, plant the seeds, water, wait about five weeks, and then enjoy a few leaves every day for months. Really, what could be easier? Even in a small window box, but like all vegetables they do like sun. The butterhead is my favourite but we are experimenting with many different varieties and colours; each has its virtues and can be counted in your efforts to enjoy eight coloured foods per day; that means 35 percent less all cause of death, remember. This page was last updated by Bernard Preston on 21 December, 2018. Experiment with different coloured lettuce plants; each has its subtle virtues, and adds variety to your plate of salads. The visual impact on the family is not unimportant. We've had half a dozen varieties growing in our garden this summer, but this butterhead lettuce by Kirchoff is my favourite. There are enough seeds in the little R15 packet, one dollar, to supply the local supermarket. I particularly like butterhead because you pick the leaves and the plant continues growing for months. 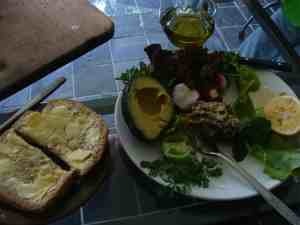 Every day, for half an hour's garden work, once off, you have fresh lettuce on the plate. There's nothing worse than old and wilting, slimy greens. No salad is complete without fresh lettuce in my humble opinion; the proliferation of recipes boasting of no greens is because they are often awful from the supermarket; grow your own; it's so easy. The leaves do start to become bitter after a couple months, so successive sowings every couple weeks make a lot of sense. Half a watering can in hot weather is vital; the leaves become tough if they dry out. In part, it's that water that they carry with them into your bowels that helps prevent the great misery, by the way. There are just so many benefits from fresh greens on the table every day; an easy stool is just one of them. 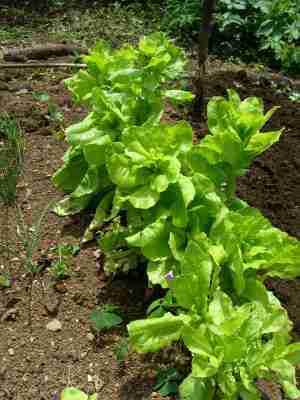 Growing lettuce is one of the easiest and most rewarding salads in the garden; high folate levels fresh on the table every day. The seeds are very small, so you need to till the ground really thoroughly. Only a yard long. This is where all that hard work with your compact compost tumbler or your own pile really comes into its own. They are heavy feeders, and if you want healthy leaves for your lettuce salad recipes, make your own or buy in some well rotted compost. Identify a one metre long piece of ground; that's all you need! This is the yard I've chosen, right next to the lettuce that are now beginning to bolt (and get bitter). A good sunny spot. Three minutes to turn the sod with a garden fork. Wear a hat... melanomas are not friendly. Having said that, is not adequate so we do need exposure to the sun; 15-30 minutes in short sleeves and shorts is what we need, and surprisingly the ultraviolet at midday is less damaging than that early and late. Here's my compost pile. 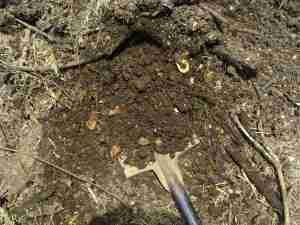 It's well rotted as you can see; in fact good compost is barely different in looks to ordinary soil. A couple spadefuls is all you need. Starting your own compost pile is hard work, unlike growing lettuce, but sooooo rewarding. Here are two spadefuls. Now fork it in thoroughly. 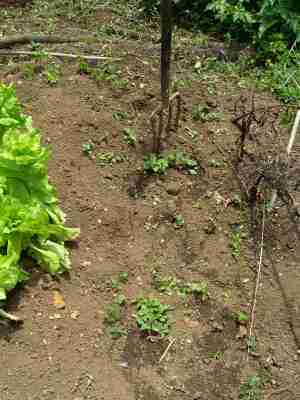 Lettuce seeds are very tiny, so break the clods down thoroughly with the garden fork. Drill in a line about half an inch deep, sprinkle the seeds very sparingly, cover and gently compact the soil. A stake at each end of the row keeps yours and other big feet at bay. Here are your lettuce seedlings two weeks later. They will need to be watered every hot day until they are well established, and do keep the weeds at bay. 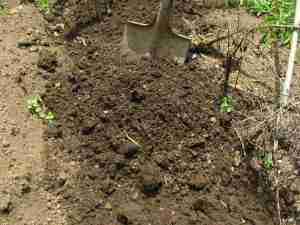 Some gardening authorities advocate transplanting the seedlings to a larger bed. Frankly I couldn't be bothered. It's a lot of schlepp, and transplanting really sets them back. You might want to transplant out a few if you've sowed the seed too thickly. 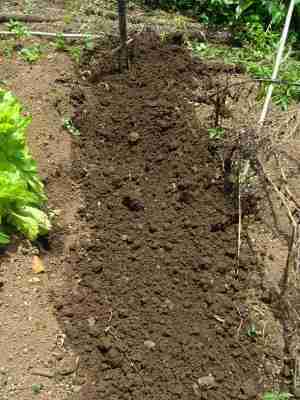 But I prefer to spread them thinly, and just sow another yard long bed in a few weeks' time. Transplanting seedlings is hard work, and it sets them back by two weeks. Rather sow your seeds thinly in situ. This year we've had a new troublesome development, not that we are going back; the addition of chickens to our garden has provided a wonderful supply of omega 3 rich golden orange yolked eggs. But the birds scratch out the baby seedlings given half a chance. We either keep them firmly in the chicken tractor, or the latest thought is to divide the garden in two with a fence; they don't eat the seedlings, just scratch them out. Once mature they much less interest than in kale and broccoli. This page on growing lettuce was written several years ago; since then I've been honing up my welding skills, working on a steel gate design and putting up a vegetable garden fence; actually several. This means we now have four large runs for the hens. As one patch of the summer vegetable garden is used up and the produce finished, so we move the birds in to clean up what's left, fertilise the ground and clean out the pests that are a problem in every patch of veggies; if it's not cutworms, then it is grasshoppers. 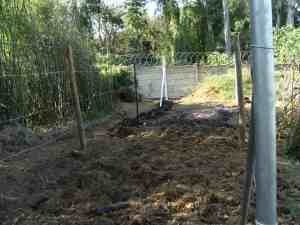 Much of the bamboo below that shades this patch has been dug out too; enough remains to protect us from the beehives. The exception is bush beans; those they nail, after the extra protein in legumes that they need for the eggs. So it's pole beans in the main in our garden. It's lovely to have these little challenges along the way, and to share them with you; you'll have your own struggles. It's all on the summer vegetable garden menu. Growing lettuce is a cinch. The seedlings above are six weeks old and we have started picking enough for a green salad every day for a week; and will continue to do so for at least two months. Fresh, crisp lettuce every day. They do prefer the cooler weather. These are the plants I sowed three months ago. They are bolting as you can see, but we've had fresh lettuce every day for over two months from this one-yard row. High folate levels will improve your children's school performance; growing lettuce is the way to start. Growing lettuce has innumerable benefits, not least that, when your friends and family cease to satisfy, there's always an escape to the garden in the offing; or a good book by Bernard Preston. Nutritionally, lettuce is loaded with a very important vitamin called Folic Acid, or folate. High folate levels are particularly important for nerves and brain and spinal cord development. Children deficient in this B9, perform poorly in school, for example. Hence my interest in growing lettuce, firstly as a grandparent (I make sure there is fresh lettuce for the family every lunch for the little people's lettuce parcels) and secondly as a chiropractor. I've had patients with spinal bifida, and it's not pretty, and entirely preventable with fresh lettuce every day. 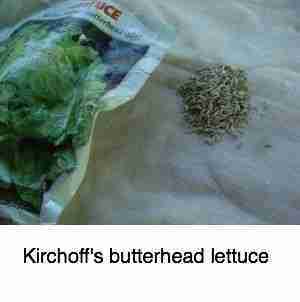 Lettuce is also one of the rich phytochemical foods by the way. Absolutely eat a minimum of five coloured foods per day, and aim for ten; if you don't want to get the big C that is! More about folate from WHF. Chicken tractor design is worthy of consideration by every organic gardener with something rather larger than a postage stamp. 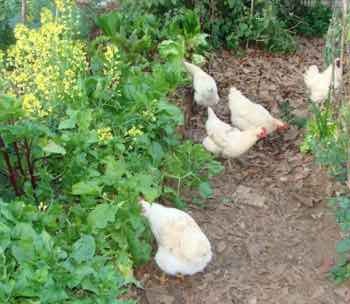 Moving the chooks from the tired looking growing lettuce patch to the corn stalks and on to the remains of the Swiss chard is what keeps them excited and healthy whilst fertilising your plot of ground with organic nitrogen rich fertiliser. Chicken tractor design come in many shapes and sizes; do your homework before choosing or making one. Your growing lettuce will thrive on the extra nutrients. Perhaps you have a problem, as did Mr McGregor with Peter Rabbit, or as we do with Henny Penny. The lettuce cage is the solution if you want to preserve your growing plants. 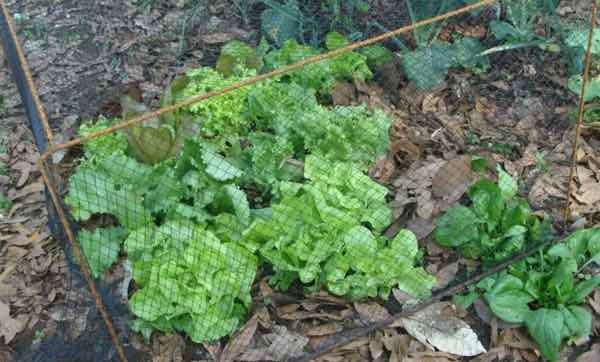 Using 5mm steel bar, bent and welded into a roughly one square metre lettuce cage, and covered with bird netting, it is easily moved being very light from one lettuce patch to another. If you don't have one of these new inverter welders, get one, and the auto darkening helmet. It is so easy to use and a very important tool for every home owner and gardener. I use mine weekly for this or that; yesterday it was for a new gate. Chickens in the garden are a pest at times; they would devour this lettuce patch in seconds, but we let them in once the lettuce is starting to bolt; now we have a fraction of the problems with the other creepy crawlies that used to mark our plants. Are you bored with retirement? Do you need a supplementary income? Growing lettuce may be a solution. In a few weeks, when we have an abundance of lettuce leaves, I'll show you how you could grow lettuce and radish, and spinach and make a very healthy little business. Your local supermarket is more than likely desperate for very fresh salads. You can profit. To do this, you'll need a large garden, of course, because you must rotate the beds. You can't grow lettuce in the same bed year after year. You will need about ten three-metre beds. 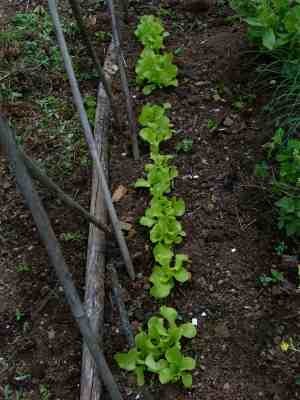 Sow your lettuce seeds in one row every week. In a month you'll have a enough lettuce to make a modest supply to the local store. Pluck off the largest healthy looking leaves every morning, wash thoroughly and put into a sealed bag. Better still, plant three different kinds of lettuce. A clean, washed bag of three lettuce leaves is what every busy woman is looking for when on the quick shop. Make them look attractive. 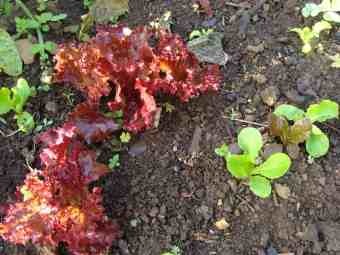 Why Growing Lettuces on a Bernard Preston website? Bernard-Preston.com is all about simple, easy healthy living. 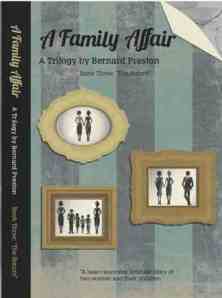 Whilst my three Bernard Preston books are all tales taken from the Chiropractic Coalface - funny, sometimes tragic, healthful stories - the underlying them is: let's move up to that higher place where we pour more energy into healthy living, and less on umpteen visits to the doctor, dentist and chiropractor! Read Stones in my Clog, or Bats in my Belfry yet? Only $2.99 on your tablet or smartphone, you won't be sorry. Promise, or your money back. Dinkum. Lettuce wraps recipes are just one way to enjoy your organic green foods. Because the folate in lettuce is so vital for school achievement we look for different ways to encourage our grandchildren to enjoy more salads; Lettuce wraps recipes are just one of them. Whether growing lettuce, or purchased from the green grocer, they give vital nutrients to us all. 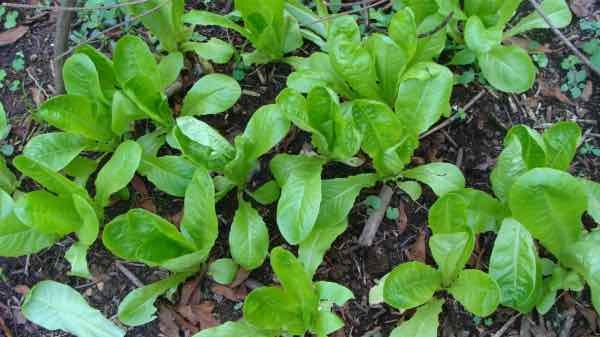 Lettuce salad recipes form the basis of most green salads and for good reasons; it's inexpensive and simple to grow and provides many vital phytosterols and nutrients. Only, it's really difficult to get them fresh. Grow your own lettuce! Bernard Preston comes from a vegetarian family, but loves meat too; he tries to combine both worlds in a nutritious and healthy way. Growing lettuce is just one way of making sure there's plenty of high folate levels in the family; sharing a home with the next generation they are passionate about the benefits of fresh, organic salads. Malignancies seems to strike all around us, so kaempferol and cancer prevention is high on the agenda; it's one of the vital bioflavonoids found is large amounts in lettuce. The wonder of worm farms for liquid fertiliser for your lettuce.